Welcome all my new followers! Thanks everyone for your wonderful support, you all make blogging so much more fun. Also, you can now follow me on bloglovin.com as well! Such a cute outfit. Love the necklace and belt. The old suitacases are very cool. Vintage items are so nice to have. Lovely pictures! Love the suitcases! Class combination of colors and the invoice. 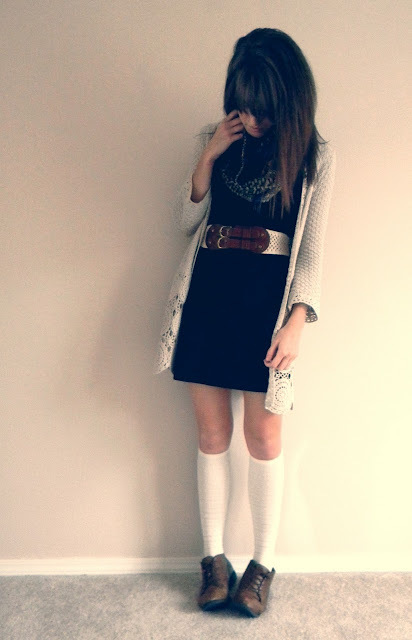 I actually wore creme knee-highs today too ha ♡ lovely scarf dear. Amazing photo's with those suit-cases. I've gotta love those suitcases with the brogues. really old fashioned but adorable! how awesome is your hair?!!!! i love this look! your socks are so cute, and the scarf looks great with the dress! i just love this look! I love these photos and your oufit is great!! 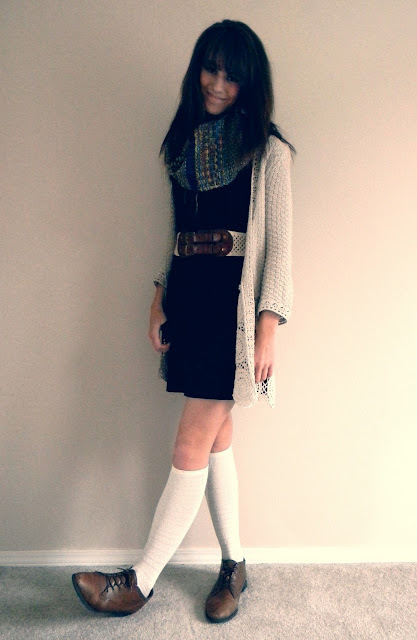 LOVE the scarf and knee-high socks! Great post, love it!! !Your outfit is absolutely amazing!!! i LOVE that belt with your dress, it looks so comfy and chic. i need to find more dresses, you'd think i'd wear more, but i really dont. bah.